Reinhardts is Your Tampa Destination for Everything Frankenstein Trikes. Take a tour of the best trike conversion company in America. 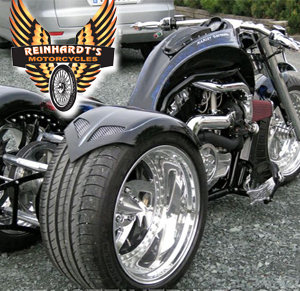 We know you already love Reinhardts for Harley service in Tampa; now Reinhardt’s is carrying the entire Frankenstein Trike line. You can view our kits and tire options with Reinhardt himself. Walk ins always welcome for preferred times call 813-909-2299. Reinhardt’s Motorcyles is a certified independent Harley repair shop currently specializing in Frankenstein Trikes as a Dealer. 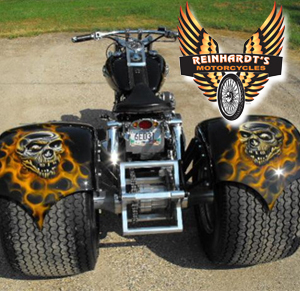 Craftsman mechanics are available @ Reinhardts to perform your trike conversions and repairs. We are consistently completing Frankenstein specific services and enjoy working to make your smile bigger using Frankenstein accessories. You will find yourself part of the family at Reinhards so bring your bike in today! Located in Northern Tampa.